The California Highway Patrol takes speeding seriously. Really seriously. 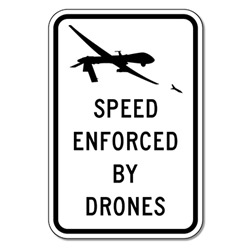 Especially if you believe a series of rogue road signs that have been popping up in Marin County informing drivers that speed is "enforced by drones." The signs, of course, were a hoax by a local resident. We thought they were great and are offering these signs to you!